The 37-36 Utah Jazz have recently surged into the 8th spot in the Western Conference. 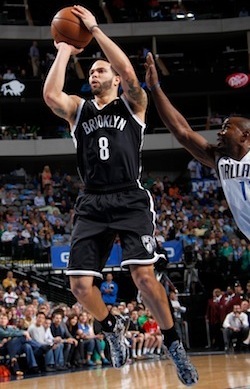 Tonight they welcome the Brooklyn Nets and PG Deron Williams to The Beehive State. Williams will surely be greeted with plenty of boos from the boisterous Jazz crowd. The 3X All-Star, who was drafted by Utah with the 3rd overall pick in 2005, will make his second return to Salt Lake City after departing via a turbulent trade on February 23rd, 2011. At 42-30 Brooklyn occupies the 4th seed in the Eastern Conference. With ten games remaining, the Nets have secured a playoff spot for the first time in six seasons. Tonight’s 48 will be game number 7 of Brooklyn’s grueling 8-game road trip. They are 4-2 after getting annihilated in Denver last night, 109-87. With starting SG Joe Johnson still out with a quad issue, the Nets starters went a combined 16 of 47 from the field in the loss. PF Reggie Evans had the best night of any of coach P.J. Carlesimo’s guys, going for 15 points and 16 boards. The Jazz played last night in Portland where they came away with just their 11th road victory of the season, 105-95. 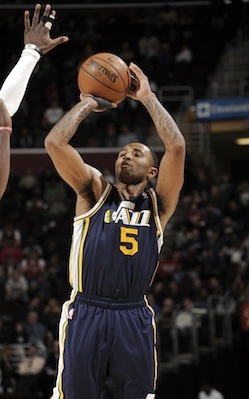 PG Mo Williams led the way with 28 points, 5 dimes and 5 boards in just 29 minutes. This was Utah’s first win away from home after dropping their previous 9 as visitors. The Jazz and Nets last battled in Brooklyn on December 18th. The Nets raced out to a 13-point halftime lead, but finished the night on the losing end of a 92-90 count. Al Jefferson had 16 points and 11 rebounds for the Jazz, while Joe Johnson led the Nets with 21 points. The Nets are 11-8 in the second half of back-to-back games this season, and Utah is a sturdy 26-9 at home. Both teams need a W tonight. Utah is barely clinging to the last playoff spot in the West. And Brooklyn must keep winning in order to secure home court for the first round of the postseason. Currently, the Nets are 2 games ahead of Chicago and 2.5 ahead of Atlanta for the 4th seed in the East. See who’s got the most gas, drive and determination left in their tank heading down the home stretch when Nets vs. Jazz tips off at 9PM ET on YES. With over 80% of the NBA regular season in the rear view mirror, fantasy GMs locked in tight races need to examine every player angle to discern who can add depth and production to their rosters heading into the homestretch. 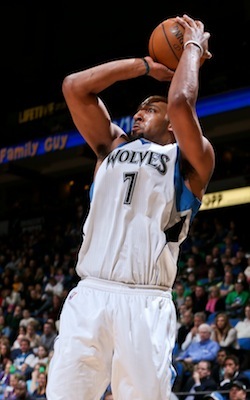 The 24-44 Minnesota Timberwolves have endured a disappointing run filled with injuries to key players. Without a postseason to play for, veteran coach Rick Adelman may experiment with his rotations and the distribution of playing time over the last 14 contests. One Minnesota player who has come on in March is second-year forward Derrick Williams. After being taken 2nd overall out of Arizona in the 2011 NBA Draft, 21-year-old Williams has underwhelmed in comparison to some forwards selected later in his draft like Kenneth Faried and Chandler Parsons. However, in 13 March games Williams has put up the best numbers of his young career. Over this span, the La Mirada, California native has averaged 16.7 ppg, 6.3 rpg and 0.7 bpg in 31.8 mpg. The 2011 Pac-10 POY scored a career-high 28 points on 3/17 and then matched it on 3/24. Williams’ field goal percentage isn’t great, but he is getting his shots – an average of 14 FG attempts in March including 3 from behind the arc, where he is a decent shooter for a big man. Williams won’t get you any assists or amaze you night after night, which is why he’s very available on the waiver wire as well as a low value trade. Look for Williams to continue to get his opportunities to score and add some boards as the season winds down for non-playoff teams.